This episode's about a man who sees a cat lying in the road. He's a nice man, so he and two small boys carry the cat away and bury it. Two schoolgirls walking past say, "If you take pity on an animal, it'll follow you home." That night, the man's at home... and there I've told enough. This kind of Flash-animated parasitic growth on a parent series isn't usually of any importance and I probably won't give it a separate review. It'll be worth a paragraph at two. It's semi-animated talking bobble-heads, basically. However it's harmless enough and, to my surprise, this particular series actually got a TV broadcast instead of just being some Blu-ray extras. Ep.0 has Tanya flying through the air, bitching about food and coffee. Viktoriya's faith is troubled by Tanya's evil psycho expressions, but she's trying to rationalise this. "She's a kind person, as I thought. When I reported that Kurst and Harald were dead, that scary face must have been my imagina..."
This is mildly amusing. A bit. I wouldn't rate it any higher than that, but I'll keep watching because these are only three-minute episodes and because I'm enthusiastic about the parent series. That was pretty boring. I managed to get through it, though. It wasn't quite bad enough to make me fast-forward, but it got close. There were three good bits, of which only one was substantial. A boy's decided to go to university in England, so obviously he's leaving the cycling club here in Japan. I quite liked his goodbye scene with Cute Bespectacled Weakling Hero, who never knew anything. The episode came alive there and had meaningful character stuff going on. The second good bit was a pre-credits sequence with Cute Hero's slightly mental mother. That was amusing. After that, the third (and nearly subliminal) good bit was in the title sequence, being a shot of one of our heroes' rivals. This is a real-world show, but he looked like a goblin and had a tongue like a frog. Otherwise, though, it's just a show about bicycles. That's the point. 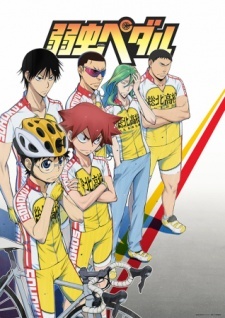 It's a cycling sports anime. Boys ride bicycles, then have bike-building tech conversations about their new bicycles. This lets them ride bicycles faster. Some other boys challenge them to a bicycle race, but our heroes discover that their rivals have done lots of bicycle muscle training! I couldn't help thinking that that must have been mind-destroyingly dull, but that's just my (slothful) prejudices. Seriously, though, this strikes me as below-par even for sports anime. I've often been surprised and impressed by the isolated episodes I watch of sports shows, but that wasn't so here. 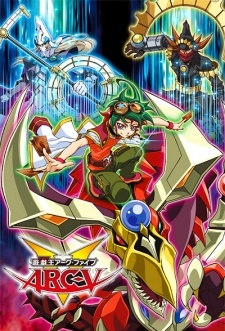 Is this the granddaddy of all trading card battle anime? Yu-Gi-Oh! 's anime franchise is now twenty years old, never mind the original manga. It's been a big hit worldwide and this is its latest iteration. The big question, of course, is the hair. Does it have Yu-Gi-Oh! hair? Answer: not that much, but our hero appears to have a light blue, dark blue and electric pink spiky alien on his head. This then becomes pink, red and yellow in Tron mode, because this episode has everyone wanting to capture an AI, with dialogue like "the firewall is being breached!" Good news: there aren't any card game battles! I didn't need to fast-forward. Bad news: even so, it's still not that interesting. They talk about card duelling and do computer hacking. It was okay, but I didn't really care. It looks like a perfectly competent example of what it is, if that makes sense. 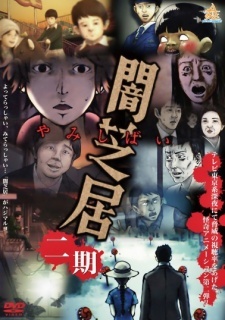 I've since finished it and... it's still a strong show, capable of being either light and charming, or tragic and ever more doomed. 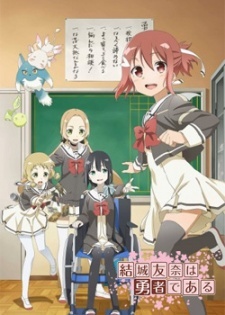 I liked the original Yuki Yuna in 2014 a good deal, so I was always going to watch this sequel. It's a bit complicated, though. These thirteen episodes are really two series: a seven-episode prequel (Washio Sumi Chapter) and a six-episode sequel (Hero Chapter). The world's still as quietly wrong and different as it was in the 2014 series, but the girls go to school and everyone seems happy enough. It's no secret that Gin, Nogi and Washio are fighting to save the world and their classmates will try to quiz them about it afterwards. I'd guess half of this episode was spent in the magical realm, getting pummelled by something colossal that can shoot death ray energy blasts. All those scenes look like an acid trip. It's pretty spectacular. It looks good. Obviously I know it's not going to end well, because this is a prequel and we already know its extremely grim conclusion. We've met the survivors. 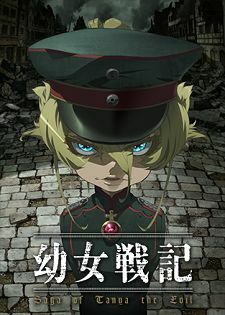 However this franchise isn't all about the despair (unlike Madoka Magica) and there's a sequel series too. For me, this is an absolute must-watch.